Dairy Farm International Holdings said on Friday that the combination of its wholly owned food retail business, Rustan Supercenters, with Robinson Retail Holdings had on Thursday received the approval of the Philippine Competition Commission. The transaction completion is expected in the next couple of months, it said in a filing to SGX after the market close on Friday. Dairy Farm, which is listed on the London Stock Exchange with secondary listings in Bermuda and Singapore, is a member of the Jardine Matheson Group, it noted. Singtel said on Monday that it and its wholly owned subsidiary Singapore Telecom International entered into an agreement on Friday to sell its 100 percent stake in GB21 (Hong Kong) to China Mobile International Infrastructure Holdings, a subsidiary of China Mobile International, for US$9.5 million, subject to adjustments for net cash. When the transaction, which is subject to fulfillment of some conditions, is completed, GB21 will cease to be a Singtel subsidiary, it said in a filing to SGX before the market open on Monday. In a separate SGX filing on Monday, Singtel said its wholly owned subsidiary Singtel Idea Factory presented a petition to the Supreme Court of Bermuda to wind up C2C Holdings, a 59.5 percent owned dormant subsidiary. 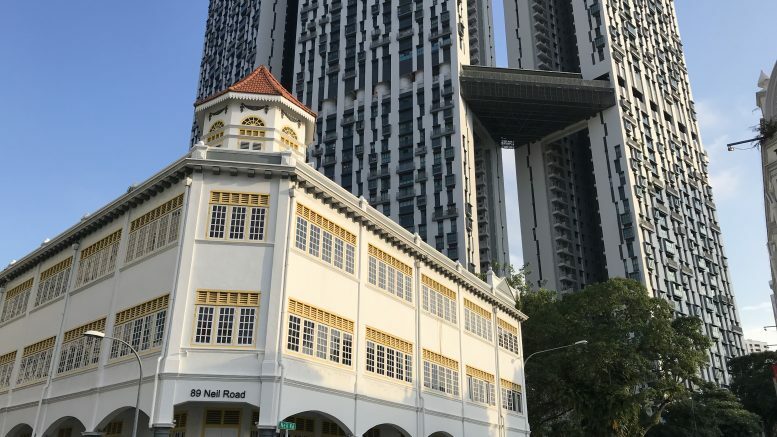 City Developments said on Friday that it bought back 200,000 shares in the market at S$9.59 to S$9.69 each for a total consideration including other costs of S$1.93 million. Since the April 2018 beginning of the buyback mandate, City Developments has bought back 500,000 shares, or 0.055 percent of the issued shares excluding treasury shares, it said in a filing to SGX after the market close on Friday. This marked City Development’s second-ever share buyback. CityDev’s shares have languished since the government announced new property cooling measures in July. CapitaLand said on Friday that it bought back 2.36 million shares in the market at S$3.32 each for a total consideration including other costs of S$7.85 million. Since the April 2018 beginning of its share buyback mandate, it has bought back 32,485,400 shares, or 0.77 percent of issued shares excluding treasury shares, it said in a filing to SGX after the market close on Friday. Noble Group said on Monday that its founder and major shareholder Richard Samuel Elman, who had been expected to be appointed an executive director of New Noble after the troubled commodity trader’s restructuring, has said that for personal reasons, he won’t be taking up the appointment. New Noble’s board will be in compliance with independence requirements under the code of corporate governance and will be in place by the restructuring compliance date, it said in a filing to SGX before the market open on Monday. It said further details on the board members would be announced prior to the restructuring effective date. Oxley Holdings said on Friday that its substantial shareholder Tee Wee Sien (Zheng Weixien) purchased 700,000 shares of the company at S$0.335 a share via a market transaction, which increased his direct interest in the company to 11.66 percent, from 11.64 percent previously. Tee has been a relatively silent stakeholder in the company and has historically stepped in to buy shares after price declines. The stock has fallen from levels around S$.041 since the July 5 move by the government to impose fresh property cooling measures; on Friday, the stock closed flat at S$0.34. Moody’s Investors Service on Thursday said that Yanlord Land’s credit metrics in the first half of the year were in line with its expectations and wouldn’t immediately affect the China property developer’s Ba2 corporate family rating or stable outlook. “Yanlord’s profit margin and EBIT interest coverage are better than many of its Chinese property peers, and its liquidity position is strong. These strengths support its credit profile,” Moody’s said in the note. EBIT stands for earnings before interest and tax. Yanlord Land published the note in a filing to SGX on Friday after the market close. Supermarket operator Sheng Siong said that Singapore’s Housing and Development Board (HDB) accepted the tender from its wholly owned subsidiary Sheng Siong Supermarket for a lease at Block 785E Woodlands Rise. The new store, of around 10,030 square feet, is expected to be operational in September, it said in a filing to SGX after the market close on Friday. Sheng Siong Supermarket on Friday also entered a lease agreement with Dollar Land Singapore for new premises at 1 Woodlands Road, Junction 10, with 20,370 square feet of retail area, conditional upon delivery of the vacated premises on 26 September, with a new store to be operational by the end of the year, it said. It also noted that operations of two new stores, at Bukit Batok Block 440 and Yishun Block 675, have begun operations, with 5,900 and 5,320 square feet of retail space respectively. The company’s total retail area will rise to 477,620 square feet, up from 436,000 square feet before the opening of the two stores and the execution of the two new leases, it said. Frasers Property said on Friday that its subsidiary Frasers Property Holdings (Thailand) issued 2.3 billion Thai baht in aggregate principal amount of 3.02 percent debentures due 2022 and 1.2 billion Thai baht in aggregate principal amount of 3.88 percent debentures due 2028. That was under the 25 billion Thai baht debenture program previously established by the Thai subsidiary, it said in a filing to SGX after the market close on Friday. The debentures are guaranteed by Frasers Property, it said. China Everbright Water said on Monday that it has issued a second tranche of yuan-denominated corporate bonds, or panda bonds, with an aggregate principal amount of 800 million yuan to investors in China on Friday. The second tranche was fully subscribed, it said in a filing to SGX before the market open on Monday. The bonds were of two types, with type-one bonds, or green bonds, having a five-year maturity and fixed interest rate, an aggregate principal amount of 400 million yuan and a coupon rate of 4.60 percent, with the proceeds earmarked for green projects; the type-two bonds, or plain-vanilla bonds, have a five-year maturity and fixed interest rate, with an aggregate principal amount of 400 million yuan and a coupon rate of 4.58 percent, with the proceeds earmarked for repayment of general indebtedness, it said. Both types of bonds and the company have a credit rating of AAA from Shanghai Brilliance Credit Rating & Investors Service, it said. In 2017, China Everbright Water received approvals from the Shanghai Stock Exchange and the China Security Regulatory Commission to issue panda bonds of up to 2.5 billion yuan, it said. The initial tranche was issued in July 2017, with a principal amount of 1 billion yuan and a coupon rate of 4.55 percent, with the proceeds used to repay existing indebtedness and replenish working capital, it said. CH Offshore said on Friday that its full fiscal year loss after tax was US$24.60 million, narrower than its year-earlier loss of US$40.08 million, while its revenue fell to US$9.91 million from US$16.41 million a year-earlier. The losses were due to one-off adjustments, including impairment provisions for its owned and jointly owned vessels and investments in an associated company and for doubtful debt provisions, as well as lower vessel utilization and charter rates and higher operating and financing expenditure, it said. Its other expenses declined to US$12.24 million in the fiscal year ended 30 June from US$33.47 million in the year-earlier period, mainly on lower vessel impairment provision adjustments, it said in a filing to SGX after the market close on Friday. “The oil and gas sector are showing sign of improvement with tender activities picking up. If oil prices continue to strengthen through 2018 and 2019, infill well drilling should resume and new production should commence as E&P companies grow more confident of oil price strength. However, in the near term, charter rates are not expected to improve due to the oversupply situation,” it said. “We are cautiously optimistic that the market will find its balance in the medium term. The group will continue to develop ways to increase operational efficiency, cut costs and preserve cash. This is the simple strategy that will allow us to ride out the rest of the downturn and be ready for the rebound in the industry,” it added. It noted that in July, Baker Technology announced that its wholly owned subsidiary BT Investment had acquired 52.72 percent of the company and then made a mandatory cash offer for the remaining shares at S$0.13 each. Keppel Telecommunications & Transportation said on Friday that its subsidiary UrbanFox Pte. incorporated a wholly owned subsidiary called UrbanFox Asia Pte. in Singapore for the purposes of investment holding. It has an issued and paid-up capital of S$10,000, it said in a filing to SGX after the market close on Friday. Spackman Entertainment Group said on Friday that its wholly owned subsidiary Frame Pictures won contracts to supply camera systems and equipment for three upcoming major South Korean drama series and a film, with a total contract value tentatively at 573 million South Korean won, or around US$515,700. The figure is subject to changes in the final filming schedule, it said in a filing to SGX after the market close on Friday. The drama series included in the contract are romantic comedy The Greatest Divorce, fantasy drama The Beauty Inside and 100 Million Stars Falling from the Sky, which is a remake of a Japanese TV series, it said. The film is called Girl Cops, which is a crime thriller directed by Jung Da-won and slated to be released in 2019, it said. GSS Energy said on Friday that it completed the re-opening of Well P1 in the Trembul Operating Area in Central Java, Indonesia, and two gas-bearing and three oil-bearing reservoirs were found in the well. With a flow rate of 2 million standard cubic feet per day (MMSCFD), equivalent to around 360 barrels of oil per day, from the two gas-bearing reservoirs, PT SGT and PT Pertamina EP have agreed on a program to produce gas from the reservoirs, it said in an SGX filing on Friday. The workover program to produce the gas will begin in September, with completion expected within the fourth quarter of this year, it said. GSS Energy holds an 89 percent interest in PT SGT and is the operator of the Trembul Kerja Sama Operasi (KSO) block, with the remaining 11 percent held by the Central Java Provincial Government-owned enterprise, it said. The well was previously drilled by Pertamina EP in 2005, it said. DBS Bank said on Friday that as the stabilizing manager for Koufu Group’s initial public offering, it has ceased price stabilization action on the stock with effect from the close of trade on Friday. The bank said in an SGX filing that it has purchased, either as the principal or through dealers acting on its behalf, a total of 15,059,300 shares of Koufu. “In this respect, we have exercised the over-allotment option granted by Jun Yuan Holdings Pte. Ltd. to us in part, in respect of 2,940,700 shares, solely for the purposes of covering the balance of the 18 million shares which had been over-allotted in connection with the offering, and which were not covered by purchases made under the price stabilizing action,” it said. This article was originally published on Monday, 20 August 2018 at 8:16 A.M. SGT; it has since been updated to include items on Singtel, Koufu and China Everbright Water.